The Partners and Staff at D Dunk Lewis & Graves firmly believe in supporting local charities; last year it was a sponsored parachute drop for leukemia done by Tara and the Rotary Club Christmas Tree Festival, this year as part of their 2016 promotional offer they are supporting Macmillan Cancer, Help for Heroes and Yorkshire Air Ambulance. 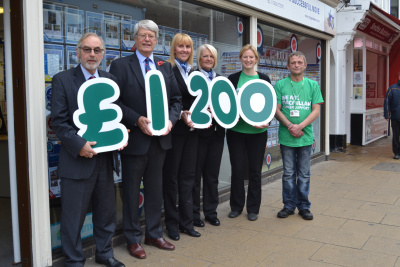 D Dunk Lewis & Graves clients decide which charity they wish to support and Hayley and Ian from Macmillan came to the Chapel Street offices in Bridlington to receive a cheque for £1200. Commenting on the presentation Richard Dunk stated that D Dunk Lewis & Graves were delighted that they were able to support the charities involved who carry out such vital work in the Bridlington Area. Later this year presentations will be made to the representatives of Help for Heroes and Yorkshire Air Ambulance.